The Presto 01264 6-Quart Aluminium Pressure Cooker is perfect for all of your low calorie healthy meal preparation (pressure cooking preserves those vital minerals, vitamins and nutrients while still keeping your chicken breasts moist) – whether you’re eating vegetables with chicken, meat or fish, the Presto 01264 will cook it all, even small cuts of meat can reach their full economic value with this revolutionary pressure cooker. No longer do we cook only on gas hobs, and Presto has recognised that, accordingly making a stand-up kitchen appliance that is suitable for both regular and smooth-top (electric) ranges. 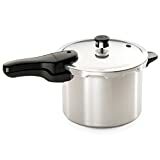 The Presto 01264 isn’t too heavy despite the fact that the pressure cooker is made of strong and heavy gauge aluminium to maximise the speed and efficiency of even heating, cleaning and an overall durability to the product – don’t believe me? Presto give this product a 12 year limited warranty. The cover lock indicator shows when pressure is present inside the cooker and so prevents the lid from being lifted until the pressure inside the pressure cooker has been reduced sufficiently to a safe level (approximately the pressure of the external environment) so that neither you, nor your friends will burn or scald yourselves, when you go to retrieve the delicious food that the Presto 01264 has cooked for you. And the Presto 01264 makes it easy to manoeuvre those dishes over to the table, or the worktop while you finish gathering everyone together for that special event, there is a helper handle to allow you to easily carry your food around without tipping it out and the special rack allows you to dictate exactly which flavours mix and which ones don’t (while taking the same amount of time to cook) so that you never have to lose your personal input on the dishes you make even when making use of the dual 64 page instruction/recipe book. Even if it’s something as simple as making soup, the Presto 01264 means that you get the most out of your cooking. With a 6-Quart (5.7 Litre) capacity, you can easily make have your soup (for the following day) and eat it too. The Presto 01264 could not possibly get any better. Between the reassuring safety features (such as the pressure regulator which ensures that the proper pressure is always maintained for, not only do you get filling and healthy, balanced meals that taste amazing every time, but you also are in no danger of harming yourself. Not that you need to stand by the pressure cooker and watch it either however. The Presto 01264 can be left alone and complete cooking your meals without you. It does rock from side to side but that’s normal and you can get on with your other jobs around the house while it does so (I even managed to get the kids to clean their bedroom). The quality of the food that comes out from the Presto 01264 is nothing short of splendid, there is a Safron Fish Stew recipe which is just divine, and it provides that same constant high quality day in, day out, meal after meal (sometimes two meals on the weekends, when the recipes have been properly divided for the amount of servings – it’s definitely a lot healthier than eating out, and cheaper too). The Presto 01264 takes mere minutes to assemble with a Phillips Screwdriver (you only have to attach the handles) and is so easy to maintain – the cover handle comes off allowing every single element of the utensil to be reached and thoroughly scrubbed with the spongy side of a pot scourer in hot sudsy water. The Presto 01264 especially proves its commitment to longevity as the pressure cooker even comes with instructions on how to keep the same shiny shade of aluminium that I got when I first bought it. I know I’ll have this machine at my side (working in my kitchen) for a long time to come. Click here to read more Presto 01264 customer reviews on Amazon.com.. Cooking rack, I know how fussy my kids can get when the herbed chicken touches the sweet potatoes, so this literally stops them having a reason for refusing to eat vegetables. Pressure regulator, just knowing that there’s such a reliable gadget watching over my food so that I don’t have to, makes me feel so much more at ease. The ability to work on smooth-top ranges, otherwise I wouldn’t be able to use the Presto 01264 and I can’t think of a single thing that would work nearly half as well as this machine. The Presto 01264 is affordable and delivers superb cooking quality from the comfort of your own home. With many pressure canners costing in excess of $200, it’s refreshing to see such a great model for less than $50! Click here to see what other customers are saying about the Presto 01264.. The Presto 01264 allows me to look forward to meals instead of grinding my teeth throughout the preparation while I’m trying to recall exactly what the recipe said. It allows for a better atmosphere at the dinner table while still letting me feel good about what I’m eating. The Presto 01264 has certainly changed my life – how about giving it a chance to change yours? The Presto 01264 is one of the most affordable pressure cookers on the market at the moment. It doesn’t have superior quality, or cooking quality – but it’s designed as a budget canner for the typical household. I am looking to replace the presto lid top handle–any information where I might order or get this? ?